What is Happening to the West Antarctic Ice Sheet? C.A. Shuman, Universities Space Research Association, Greenbelt, MD. For many of the last thirty years, the West Antarctic ice sheet has been in the scientific spotlight. Containing enough ice to raise sea level 5 meters, recent concern has centered on whether all or part of this contribution might be delivered rapidly into the ocean (IPCC, 1996; Oppenheimer, 1998). Investigating this potential has led Antarctic scientists to address a series of related questions: Why, when, and how much ice has been lost by the ice sheet since the Last Glacial Maximum? Was it ever smaller during Glacial Minima than it is today? Do its fringing ice shelves or its marine base make it inherently unstable? Storm clouds blown onshore by intense cyclones deliver snow that feeds the ice sheet. Snow slowly compresses into ice and, in West Antarctica, most returns rapidly to the floating ice shelves through a set of fast moving ice streams sliding on water-saturated marine sediments. Information of the history of the ice sheet is imprinted on the sea floor, etched across the exposed mountains and locked within the ice. This history must be reconciled with measurements of the sheet's current behavior and the ways in which the adjacent atmosphere, lithosphere and ocean affect the ice sheet to formulate a fuller understanding of the ice sheet's behavior. Only then can the future of the ice sheet be predicted. The multidisciplinary West Antarctic Ice Sheet (WAIS) program addresses the West Antarctic as an interacting environmental system (Figure 1). WAIS includes several key questions that have directed our research in recent years. Figure 1. West Antarctica is a tightly coupled, dynamic environment. The size of the ice sheet depends on snow accumulation, wind-driven ablation, and subglacial melting and freezing. Under the floating ice shelves, circulating waters can drive melt rates in excess of 10 meters per year. The shape of the ice sheet depends on ice-flow which varies more than two orders of magnitude from the slow interior to the rapidly sliding ice streams. Subglacial water and till properties are strong influences on where faster motion occurs. Ice domes and divides are the most stable locations for deposition and englacial archiving of past atmospheric samples. Records of past ice-sheet extents are found in the isolated mountains high enough to emerge from the ice-sheet surface, and on the floor of the seas surrounding the ice sheet. What is the deglaciation history in the Ross, Bellingshausen and Amundsen Seas? Significant headway has been made toward reconstructing the ice sheet in the Ross Sea during the Last Glacial Maximum. Marine geological and geophysical data provide compelling evidence that both the East and West Antarctic ice sheets advanced across the continental shelf during the Last Glacial Maximum. Shortly after post-glacial sea level began to rise, due initially to the retreat of Northern Hemisphere ice sheets, the East Antarctic ice sheet began to retreat (about 17,000 years ago), followed much later by the retreat of West Antarctica (about 10,000 years ago). Retreating West Antarctic ice exposed the Ross Sea floor to examination by marine geologists. The sea floor consists of sedimentary deposits that are thicker with distance from the present ice sheet. Large troughs, tens of kilometers wide and carved into the sea floor, also contain seaward-thickened till sheets. These features indicate grounded ice streams deformed the basal till as the ice sheet advanced seaward. The ice sheet expanded to within 150 km of the continental shelf edge in the western Ross Sea and to the shelf break in the Eastern Ross Sea. Banks between the broad sea-floor troughs are eroded and covered with little or no till and significant subglacial meltwater appears to have been absent in most areas. Glacial marine sediments draped on top of the sea floor are very thin, indicating that grounding-line retreat from the continental shelf edge was rapid, but timing and details of the retreat phase are hampered by uncertainty in the radiocarbon reservoir correction. Figure 2. 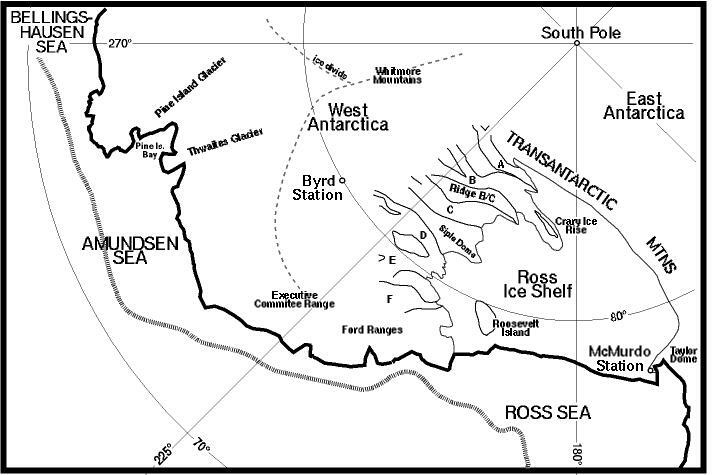 Locations of West Antarctic features discussed in the text. Letters A-F refer to ice streams. Hatched line is edge of continental shelf. What is the ice-surface elevation history revealed in the mountains (or elsewhere) within West Antarctica? The volcanic record suggests that a continuous West Antarctic ice sheet first appeared approximately 9 million years ago. Since then numerous fluctuations have occurred with repeated periods during which it resembled today's ice sheet. However, expansions during the last one Ma of up to 550 m thicker ice are recorded on near-coastal volcanoes. In the Executive Committee Range (Figure 2), lateral moraines up to 100 m above the present ice sheet surface verify several higher stands during the last four glacial periods, the most recent being 20,000 years ago, while in the block-faulted, near-coastal Ford Ranges, evidence of occupation by the ice sheet is present 800 meters above the present ice surface. A comparison between oxygen-isotopic records from Taylor Dome (East Antarctica) and Byrd Station (West Antarctica) suggests that the West Antarctic thinned several hundred meters during deglaciation one Ma and another 200-400 m during the last 10,000 years. Similar techniques must be applied elsewhere within West Antarctica to establish its contribution to the post-glacial sea-level rise. Ice coring at Siple Dome, begun in late 1997, is expected to contribute a detailed historical record of atmospheric chemistry and surface elevation. What determines the positions of ice stream margins and their effect on the discharge of ice through the ice streams? Ice-stream margins are the boundary layer between the fast moving ice stream and much slower inter-ice-stream ice. Due to effective lubrication beneath the ice streams, the margins support a significant fraction of the gravitational force driving ice flow. Current outward migration of parts of ice stream B's margin and new results showing a stepwise reduction in the width of ice stream C prior to the cessation of C's streaming flow prove that margins can shift, probably in response to changing thermal and hydrological conditions at the base (Figure 2). These changes in ice-stream width alter the balance of forces and the rate of ice discharge into the Ross Ice Shelf. Recently delineated tracks of ice-stream margins carried onto the Ross Ice Shelf show that large changes in ice-stream widths (and probably discharge) occurred during the last thousand years. In contrast to this evidence for margin mobility, poorly lubricated "sticky" zones at the bed unrelated to identifiable basal topography have been inferred beneath the outermost inactive margins of both C and D against Siple Dome. Layering of radar-reflectors within the ice indicates that fast streaming motion was prevented in spite of substantial basal melting and bed lubrication. This suggests Siple Dome is strongly resistant to streaming flow, has never been overridden by ice streams, and is maintained by stable boundaries associated with its subglacial geology. The implication of geologic control on the general location of an inter-ice-stream area, such as Siple Dome, is consistent with the emerging picture of former-ice-stream tracks on the Ross Sea floor and of the correspondence between subglacial valleys and the flow direction of incipient ice streams. Whether the other inter-ice-stream areas are similarly stable is an open question. Surface scars well into the interior of Ridge B/C suggest that B may have recently occupied parts of this ridge's present location. What determines the location of onset areas and are they fixed? Onset regions refer to the region where ice flow switches from slow flow in the thick, inland reservoir to fast flow in the thinner, marginal ice streams. Were the onset to migrate inland, acceleration and thinning of reservoir ice would reduce ice-sheet volume, raising sea level. Analysis of GPS data pinpoint the onset of ice stream D (Figure 2) by demonstrating a clear transition in the relationship between driving forces and ice speed. Near the head of adjacent ice stream C, seismic data and GPS surveying illustrate that ice-stream flow occurs over a sedimentary basin with very close spatial coincidence of the ice-stream margin and basin margin. Further downflow, ice streams tend to occupy subglacial troughs, but the correlation is not universal. How can ice streams be modeled more realistically? As the critical element mass transport within the ice sheet, models of ice streams must be realistic. This requires a fully coupled solution of mass, momentum, and energy conservation equations. For each of the different component equations, mechanisms for moving fluxes of ice, water, and till must be defined. At this point, the flow law for ice deformation is fairly well understood, although some uncertainty persists as to the value of temperature-dependent and fabric-dependent parameters. The sliding law remains poorly understood but must depend in some way on the presence of liquid water at the base. Several different sliding models exist which behave differently under different conditions. Local measurements under ice stream B measure relatively little deformation of the subglacial till. The presence and amount of water at the base are determined by the basal melting/freezing rates, which depend on the overall temperature field and the geothermal heat flow. How this water moves subglacially is an important issue that requires a model of basal hydrology including sources/sinks due to basal melting/freezing, as well as loss to an underlying aquifer or to the ocean. The specification of forces requires knowledge of the ice-sheet geometry, i.e., bedrock and surface topography. Conservation of energy requires both the ice geometry (hence the coupling) and the velocity field. Surface boundary conditions, such as annual average temperature and surface mass balance, can come from measurements, GCMs, or simple climate parameterizations. Basal boundary conditions like geothermal heat flux are not well known over wide areas and either must be inferred from broader geological considerations or measured by drilling programs. All these data must be collected at higher resolution and with better accuracy than presently available and be distributable in electronic form. Most modelers still use maps which need to be updated to include the wealth of new data that has been collected since 1983. What is the modern spatial distribution of, and controls on, mass input to the West Antarctic ice sheet? Dynamic atmospheric modeling, general circulation modeling, and synoptic remote sensing observations all suggest that a majority of precipitation reaches West Antarctica across the coasts of the Bellingshausen and Amundsen Seas and to a lesser extent over the Ross Sea (Figure 2). A persistent low-pressure center off the coast in the Southeast Pacific region facilitates inland moisture transport and produces accumulation highs along the West Antarctic coast and at the interior divide. Accumulation decreases substantially away from these local maxima. Air masses with reduced moisture content then diverge, flow along the Transantarctic Mountains and return to the coast This characterization is supported by site-specific observations at automatic weather stations, in snow pits and from ice cores. Important, but poorly defined, local-scale variations in accumulation impact the ability to calculate the regional mass accumulation and remains the single largest error in calculations of ice-sheet mass balance. Local accumulation variations also confound attempts to resolve the seasonal pattern of accumulation from in situ measurements. Mass loss is usually a negligible term over most of the ice sheet, but the descent of low-humidity air masses over the ice streams to the Ross Ice Shelf may induce significant sublimation from the near-surface snow pack. What are the mass budgets underneath the ice shelves and what factors control their spatial variability? Ice shelves and floating glacier tongues comprise more than 30% of the West Antarctic area and receive nearly 40% of its precipitation. Ice shelves on both sides of the Antarctic Peninsula have retreated over recent decades, in concert with regional atmospheric warming. Steady advances of the ice fronts punctuated by large iceberg calving events appear to characterize West Antarctic ice shelves although satellite radar interferometry suggests recent retreat of the junction between the grounded Pine Island Glacier and its ice shelf in Pine Island Bay (Figure 2). More difficult to monitor are the bottom surfaces of ice shelves, which interact with the underlying ocean. Direct ocean measurements and 3-D modeling of ocean-ice interactions near and beneath the Filchner-Ronne and Amery Ice Shelves indicate lower basal melt rates than estimated several years ago, with complex melting and freezing patterns. Similar work in the Amundsen Sea's Pine Island Bay suggests much higher melting than previously assumed for that region. Over Antarctica's entire 1.5 million km2 of floating ice, basal melting minus freezing appears to exceed surface accumulation. The fate of the ice shelves in a warmer climate may hinge upon changes in the relative strengths of the cold shelf-water circulations that now dominates the major embayments, and the relatively warm deep-water circulation that now pervades the Southeast Pacific sector. Can current coupled atmosphere-ocean GCMs accurately simulate the climate in the West Antarctic region? Longer-term simulations of the ice sheet require that GCMs adequately incorporate the critical climate interactions. Detailed experiments of the Antarctic region with fully coupled atmosphere-ocean-ice GCMs are still in the planning stage. Initial results will be qualified by the current lack of data from much of the region. The South Pacific is a particularly important area for data collection, both to constrain and to initiate any GCM intended to produce accurate results for West Antarctica. Work is needed to contribute Antarctic-specific parameterizations for GCM experiments. The cloud-radiation interaction is a particularly important process that is incorrectly parameterized for the current models. How can WAIS better educate the public and the scientific community? Since the inception of WAIS, its researchers have participated in National Science Foundation programs such as Research Experiences for Undergraduates and Teachers Experiencing Antarctica. Several WAIS- related educational projects have been undertaken involving strong researcher/educator collaboration over a variety of topics and levels. Antarctic Science and Policy: Interdisciplinary Research Education (ASPIRE) uses the structure and implementation of the Antarctic Treaty to investigate social-, political-, and natural-science issues in the undergraduate classroom. The middle-school curriculum materials of GLACIER (http://www.glacier.rice.edu) explore earth-science concepts through thematic modules centered on interdisciplinary questions. Common themes in these programs are the use of the unique Antarctic environment as a vehicle to engage students in the process of science and the integration of real data with relevant issues facing the Antarctic and global communities. Annual workshops have become the forum at which WAIS scientists exchange their latest results and ideas. These meetings are important milestones as WAIS investigators continue to pursue more complete answers to the above questions which were drawn from the WAIS Science and Implementation Plan . This plan, abstracts from past workshops, and more information about WAIS are accessible at the WAIS web site (http://igloo.gsfc.nasa.gov/wais). A Chapman Conference on "The West Antarctic Ice Sheet" will be held September 13-18, 1998 at the University of Maine in Orono, Maine. This meeting will be the first joint meeting between WAIS and it European counterpart, the Filchner-Ronne Ice Shelf Programme, which concentrates its investigations on the easternmost portion of West Antarctica. Details on this meeting have appeared in Eos and are available at the AGU web site (http://www.agu.org). Abstracts to this meeting are due June 15, 1998. IPCC, 1996. Climate Change 1995, The Science of Climate Change, J.T. Houghton, L.G. Meira Filho, B.A. Callander, N. Harris, A. Kattenberg and K. Maskell (ed. ), Cambridge University Press, 572 pp. Oppenheimer, M., 1998. Global Warming and the Stability of the West Antarctic Ice Sheet, Nature, in press. The workshop was partially supported by grant OPP-634698 from the National Science Foundation Office of Polar Programs.